Picture perfect the space shuttle Atlantis has successfully lifted and is embarking on its final planned mission. During the 12-day flight, Atlantis and six astronauts will fly to the International Space Station, leaving behind a Russian Mini Research Module, a set of batteries for the station's truss and dish antenna, along with other replacement parts. The mission's six astronauts all are strapped into their seats in Atlantis' crew module, the external tank is fully loaded with liquid oxygen and liquid hydrogen. Weather still looks great for launch time. Weather Officer Todd McNamara predicts a 70 percent chance of good conditions at liftoff. A team of engineers is studying a ball bearing that was found. The piece has been identified as a part of a camera system and is undergoing further analysis, NASA Launch Commentator George Diller said. The launch team is still pressing ahead toward an on-time liftoff, Diller said, while the research on the bearing takes place. Astronaut Michael Collins told a documentary crew that sitting on top of a rocket during the countdown is mostly about clearing milestones in a checklist and not really believing anything is going to actually happen. Until, that is, the last few minutes in the count, when it "feels like somebody turned on a light switch" and the astronauts start to think, 'Hey, I think we're going to go!" Collins was talking about launching aboard a Saturn V on Apollo 11's flight to the moon, but those emotions translate almost exactly to the launch day experience during a shuttle count. There are just so many technical steps along the way that an average observer would think there is almost no chance of everything lining up right to allow a liftoff. However, the launch and shuttle processing teams are not composed of average observers, and they manage to get all the pieces to line up more often than not, especially lately. But Collins' point holds up: Every launch day begins with a slight sense of "hmmmm, will we go today?" Then at some point late in the count comes a jolt that makes everyone watching suddenly spring across the chasm from skeptic to believer. T-9 minutes and holding . . . This hold will last 45 minutes. 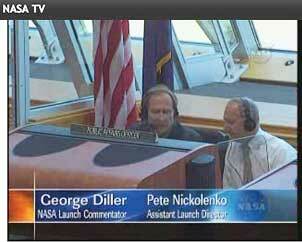 The launch treams and Mission Management Team will give their final "go/no-go" decision during this pause. 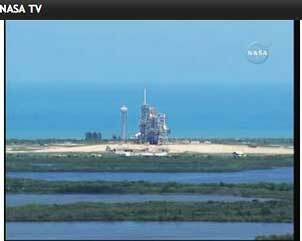 The clocks will begin ticking again at 2:11 p.m. in the final run-up to liftoff.